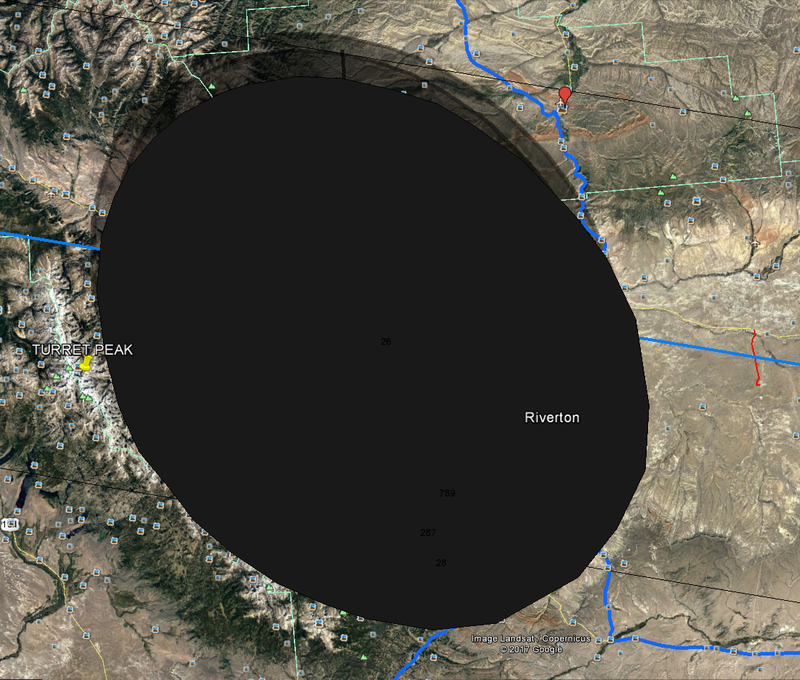 In the 1st part of this article I shown you how to create the “umbra” in Scribble Maps and use it in Google Earth as a .kml file. Here I would like to demonstrate step by step how to create a pretty good animation from .kml “umbra” file, which you have gained arleady. Well, you have a ready prepared umbra, which you can use in the Google Earth software. However the biggest drawback of this is an option only for one certain moment. You can’t see how would be your observation like during the mid-eclipse, 3rd contact etc. until you create a few another ‘shadows’ in the immediate vicinity. 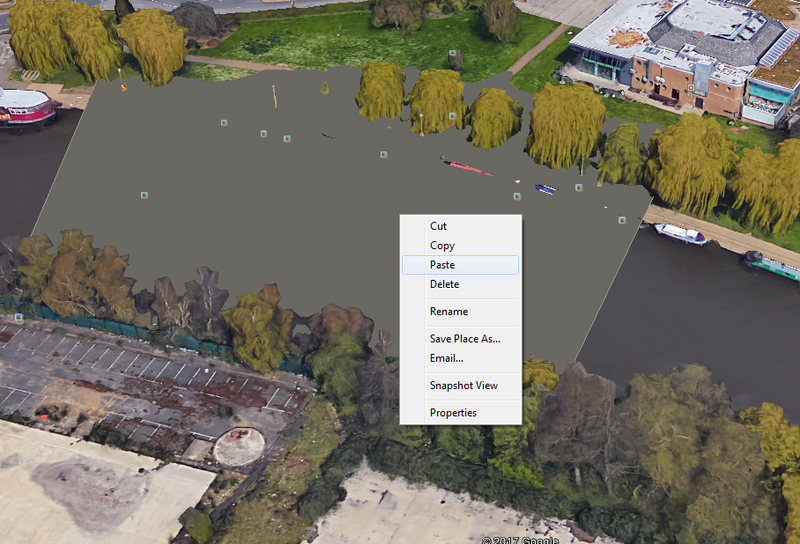 To create new umbra for Google Earth you need to move your previously created shape on 1, 2, 5 or more ‘seconds’ ahead on your Scribble Map. I moved mine just about 10 sec. To be said this is the shortest interval between manual photos taking during the totality especially when the changing of parameters is needed. 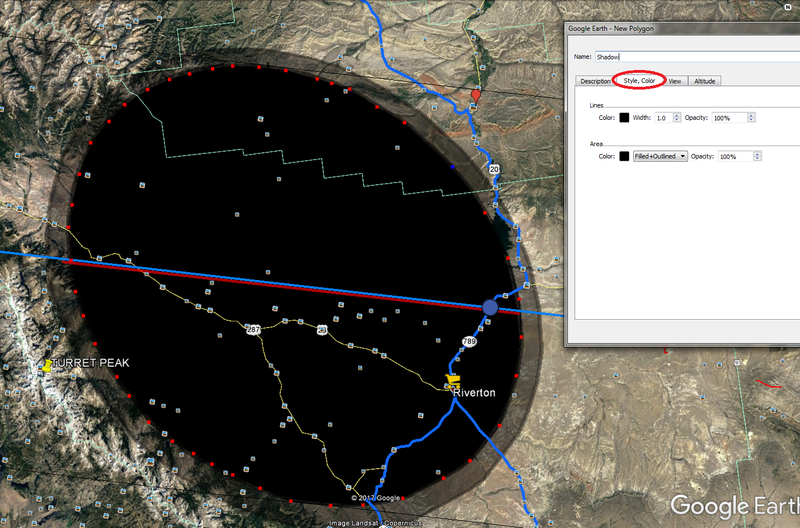 To move the whole ‘shadow’ ahead you need first to map proper time values on NASA interactive map. 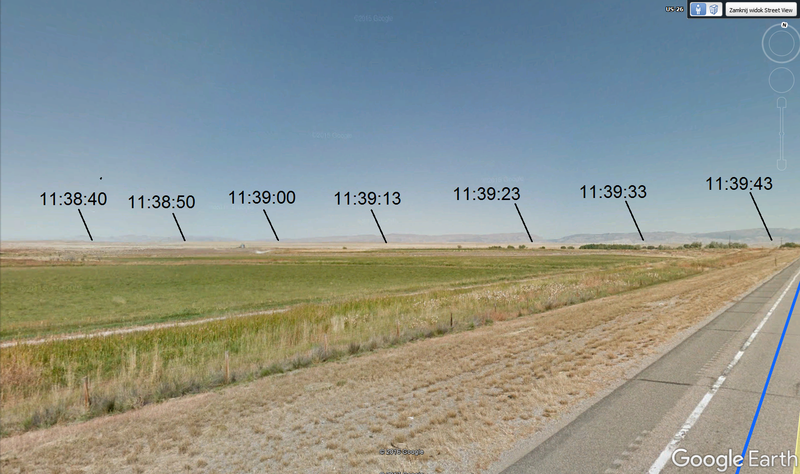 Find the places which correspond with appropriate time values (pic. 1 – 3). Pic. 1 Map a proper time values for 2nd (or rd contact) depends what direction is better for you. 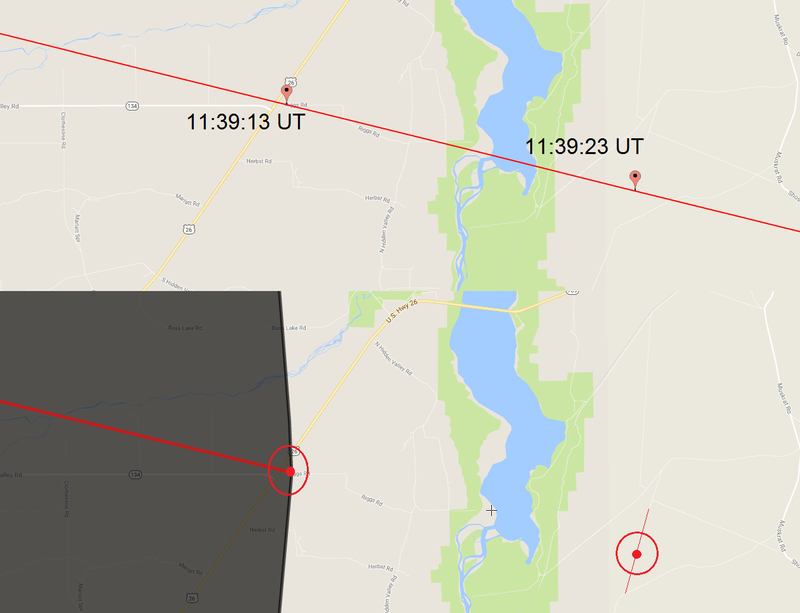 I put markers for 2nd contact (eclipse.gfsc.nasa.gov). Pic. 2, 3 New markers selected for every 5 seconds ahead along the centerline. 3. Go to the Scribble Maps and select cursor from your top bar. Next you can move your cursor on your selected object to hover it (pic. 4). When object hovered you can move it. Remember that to move the object you need to see your cursor like cross. Usually in the meantime the hovered object will turn into blue. Now to move object you must click, then hold and drag gently to your next position expected. Remember that operation should be carried out slowly. The best way to make a good movement is keeping eye for exactly one point and move it slowly. This “point” suppose to be on the centerline. It will allow you to lead your “umbra” roughly within the calculated path of Totality and control everything step by step. I have moved my “umbra” for every 10 seconds. 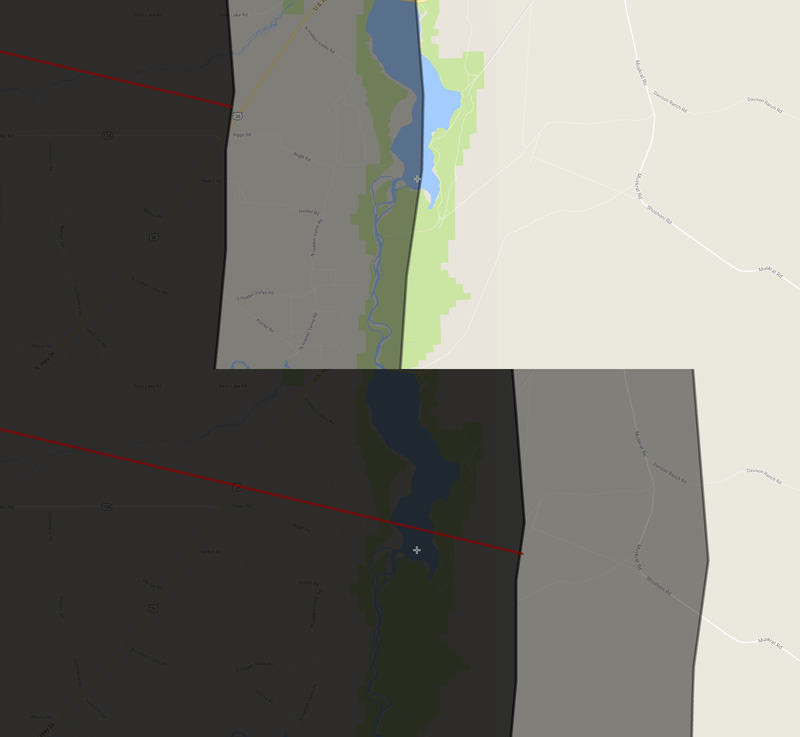 It’s good to do likewise when you started to draw the polygon in Scribble Maps – keep both eclipse.nasa.gov interactive map and your scribble map on the same zoom level (pic. 5). Pic. 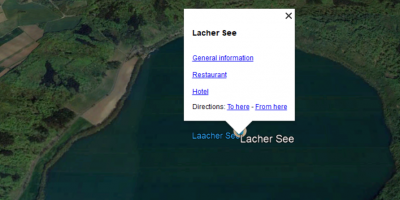 4 In Scribble Maps toolbar select cursor and you should see your object in a blue color. It means that it is arleady selected and ready for modification (see rectangles on the edge). You can also see the surface of your object in square km. Pic. 5 Moving the object in the Scribble Maps (below) with respect to NASA interactive map (above). 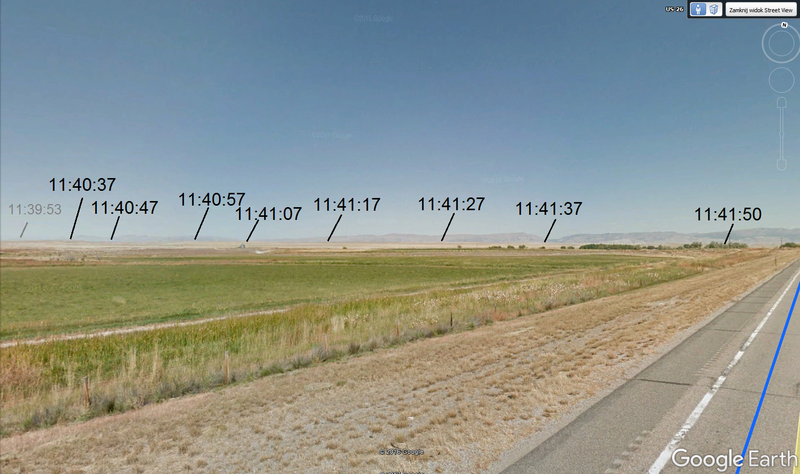 Selected markers shows the time of 2nd contact. According to those markers I have to find the same places in Scribble Maps. It may be quite difficult, when your next circumstance occures in featureless area. In this case you may use nearest object & roads as a help. I linked them by line, which middle part indicated me the rough point of my marker. Next I have moved my “umbra” to that point. 4. Do the same things for all your eclipse elements: centerline and mid-eclipse line. Order may be random. In my case I moved centerline as a first, umbra as a second, mid-eclipse as a third and grazing zone area as a last. Pic. 6 Moving all stuff a 10s ahead. See the shadow, centerline and grazing zone for 11:39:13 UT on the top and the same elements for 11:39:23 UT on the bottom. 5. When you finish remember to save your map and what is the most important save your .kml file, naming it as a time value. 6. 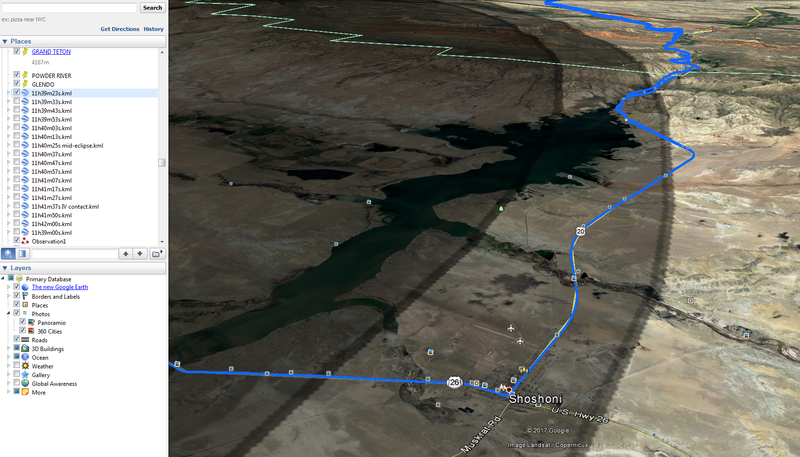 After a few similar operations you should have a several .kml files on your Google Earth ‘Places’ list (pic. 7). Making all of them active you should receive a nice “umbra” movement sequence (pic. 8). Pic. 7 List of your “umbra” objects separated by 10 seconds (2nd contact). Each of them contains two polygons “umbra” and “grazing zones” and two lines: dark – mid-eclipse line, red – centerline. Pic. 8 When you make all of them active you can see a nice umbra sequence plotted in the path of totality. 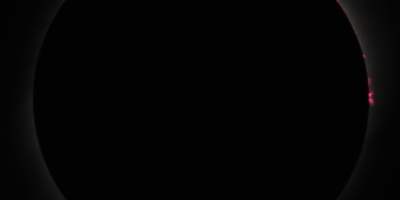 This is “Voice of western Wyoming” for 3 minutes 17:39 – 17:42 UTC. 7. 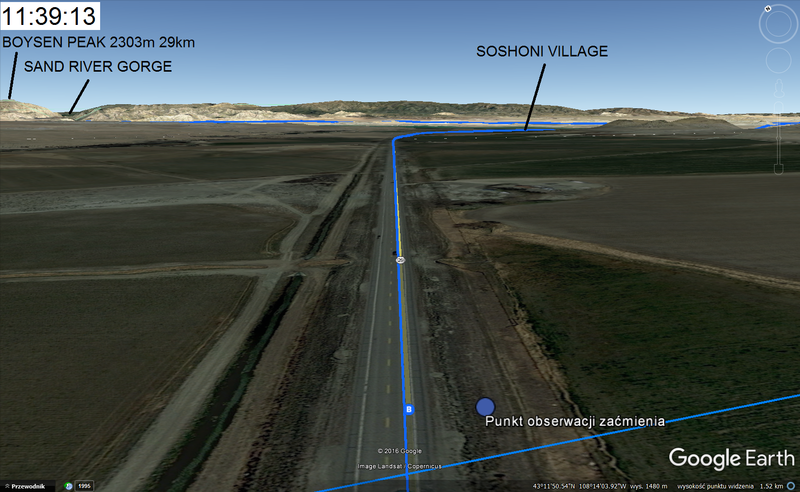 For the TSE Google Earth animation you will need around 15 umbra models separated by 10 second intervals (pic. 8). However you can always make more if you need. 8. 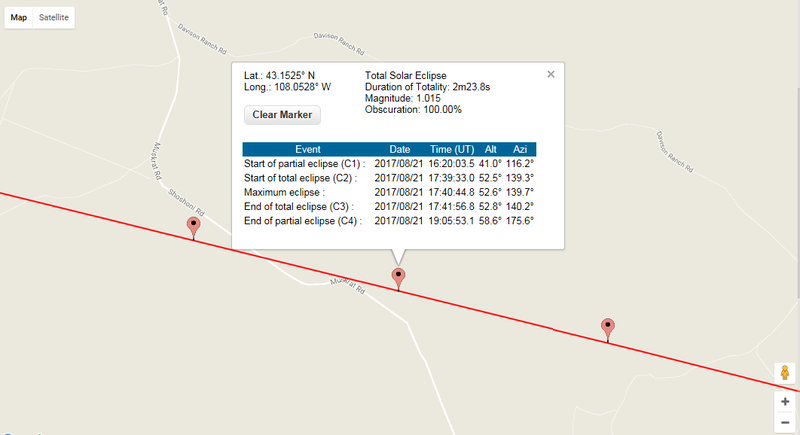 Now when you have your full sequence you can analyse the total solar eclipse for your position with 10 second intervals. You can do it either from the top or from oblique view. When your observation place is located in mountainous area you can visualize it using the ground view also. Everything you are doing using the left bar with “places” where you switching off 1 layer (umbra) and switch on a following one (pic. 9 – 13). Pic. 9 Analysing the umbra circumstances for the time 11:40:57 UT – oblique view. Pic. 10 Just about 1 second after IIIrd contact in Riverton – close-up oblique view, 11:41:17 UT. Pic. 12 The same moment seen from different, lower angle, close-up to ground level. Marked places shows the moment around 2nd contact, 11:39:23 UT. Pic. 14 … and 3rd contact also. 9. for the TSE animation purpose you need to save every snap received in the Google. You can do it quickly by clicking Ctrl+Alt+S. Aside for the “umbra” on the ground you are able to generate also the another shadow, hung up in the Earth’s atmosphere. Before I describe you how to do it I will explain you the essence of this step. Presumably you have seen the Earth’s shadow which is to be seen every day before sunrise and after sunset also. If you take a detailed look for it you will spot that Earth’s shadow looks like a vast roll moving across the sky. Now let’s consider which part of the atmosphere causes the Belt of Venus known also like twilight wedge. The best moment to look on it is when Sun is around 3-4 deg below the horizon. Then the twilight wedge is located around 10-20 deg above horizon and appears like diffused reddish band (pic. 15). Pic. 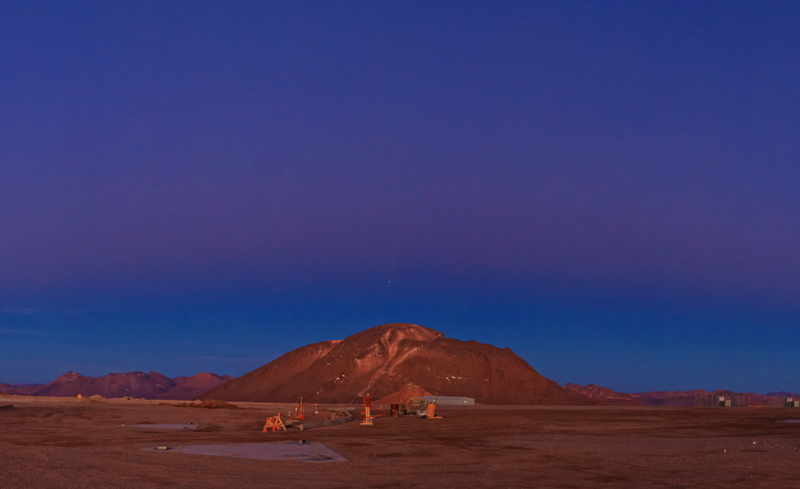 15 The Belt of Venus above the Llano de Chajnantor Observatory in Chile (wikimedia.org). Baily’s beds appearance, that makes the light dropping effect stronger. It should make this effect slightly stronger than during the twilight. Let’s considerate which layer of the atmosphere is “responsible” for both twilight wedge and “on the sky” umbra. There is a couple formulas, which allows you to calculate relation between altitude and dip of the horizon. I used the formula below (pic. 16). Pic. 16 A dip of the horizon formula: r – Earth’s radius, h – height. This formula may be used up to 200 miles above ground. Your “Alpha” will be the angle between line of horizon and visual horizon. I could count the altitude of this phenomena. It takes in Ozone Layer , which covers lower stratosphere between 20 and 40 km. I created my “on the sky” umbra 27,5 km above ground, however this is an assumptive value. You need to know that dip of the horizon from this layer is 6 deg (pic. 17). Pic. 17 Cross section of the Earth’s atmosphere with ozone layer concentration marked with red lines. 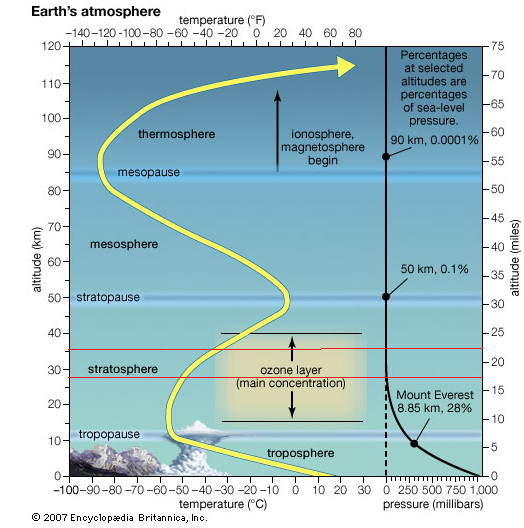 Main ozone concentration is between 15 and 40 km, however the part of this atmosphere layer, which causes the civil wedge is between 27 and 36 km above ground. A 6 deg dip of the dorizon occures around 35 km above ground (britannica.com). How to create the “on the sky” umbra then? Basically there are 2 ways. I will show you the easy one first and try to describe more complicated next. 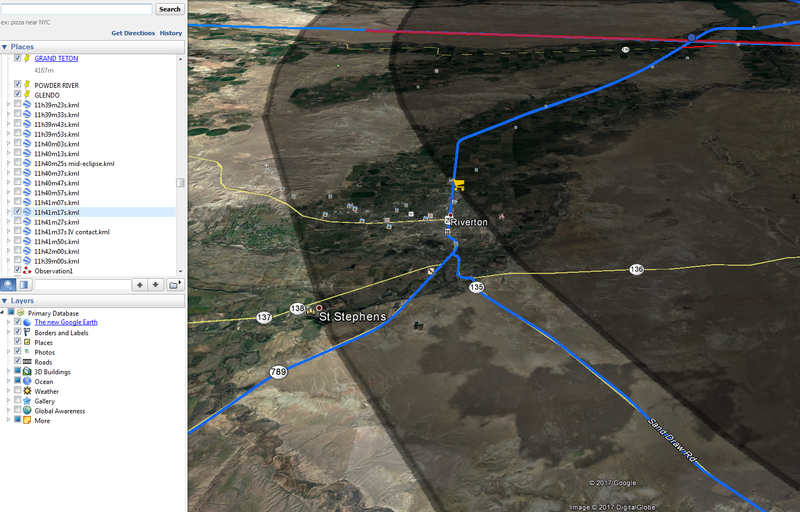 Go on your newly created umbra in Google Earth and sketch out exactly the same one making it completely dark. I put 100% opacity for mine. Repeat the process in case of the grazing zone make it slightly more transparent (I put 50% opacity for my one) (pic.18 – 19). Pic. 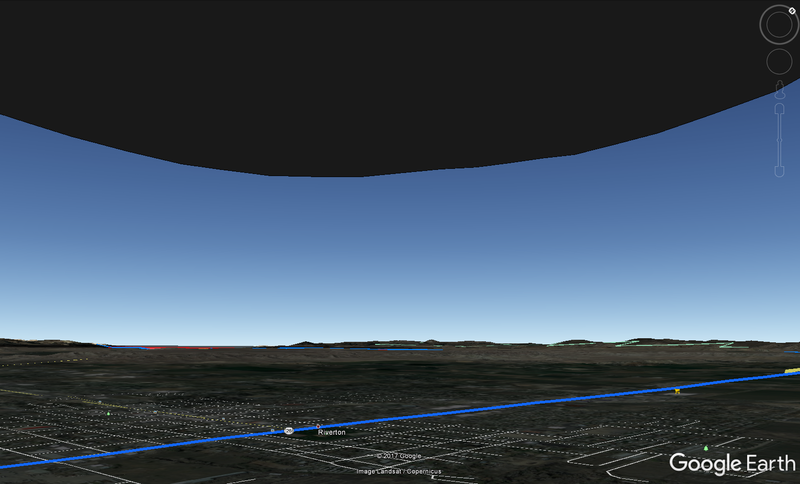 18 Draw the polygon using Google Earth software covering exactly .kml umbra shape done in Scribble Maps. Pic. 19 Once you do it change the color turning your whole figure into black, keep 100% opacity. 2. In the altitude section select the “Relative to the ground”option and put the value 27500 m on the left. Do the same for grazing zone layer also (pic. 20). Pic. 20 Newly created polygon lifted up to 27500 m above ground. 3. 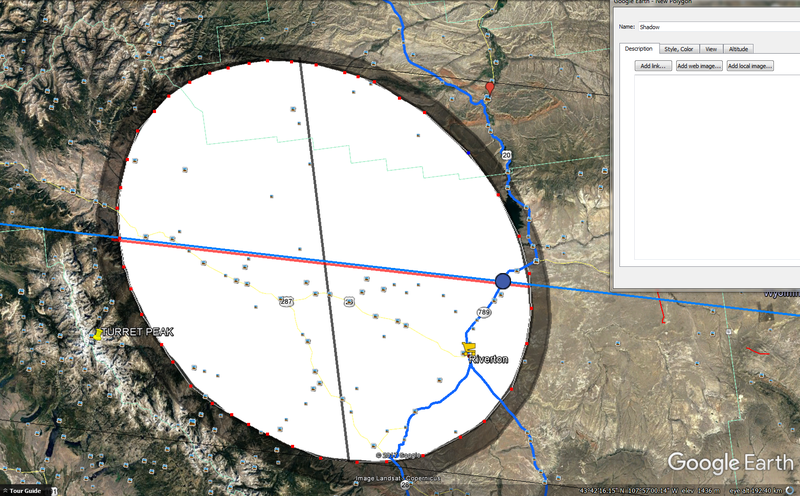 Now you can enjoy your full total solar eclipse simulation with umbra both on the ground and on the sky. 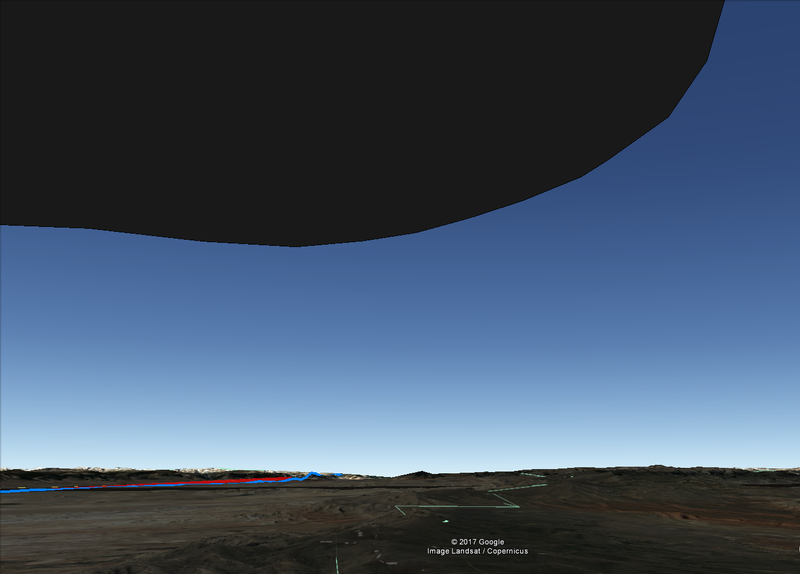 You can obviously zoom in and out, however when you have both “shadows” created the best way to see the virtual eclipse phenomena is looking from the ground level. You must be aware that this model is much simplified. We are taking into account the situation, when eclipsed Sun is shining in the zenith. Those situations are very rare. Pic. 21 Vizualised panorama of Riverton town at the moment of total solar eclipse on 21.08.2017 made by Google Earth. You can see the umbra both on the ground and on the sky. Pic. 22 Vizualised shadow of the moon seen in the Earth’s atmosphere above Casper at the time 11:39:13 UT on 21.08.2017. Know about the azimuth and height of the Sun at the moment of total solar eclipse. For Casper it will be accordingly 140 deg and 53 deg. 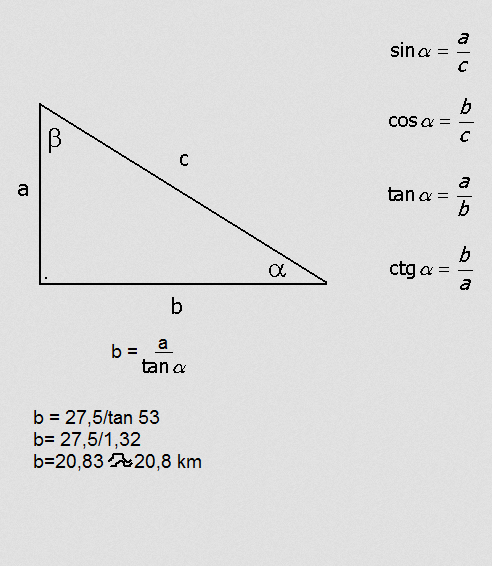 Use the trigonometric functions for the calculation (tangent only) (pic. 23) and calculete the proper value. Pic. 23 Calculated value for Casper. On the sky umbra edge in zenith should be around 21 km inside the ground umbra. Pic. 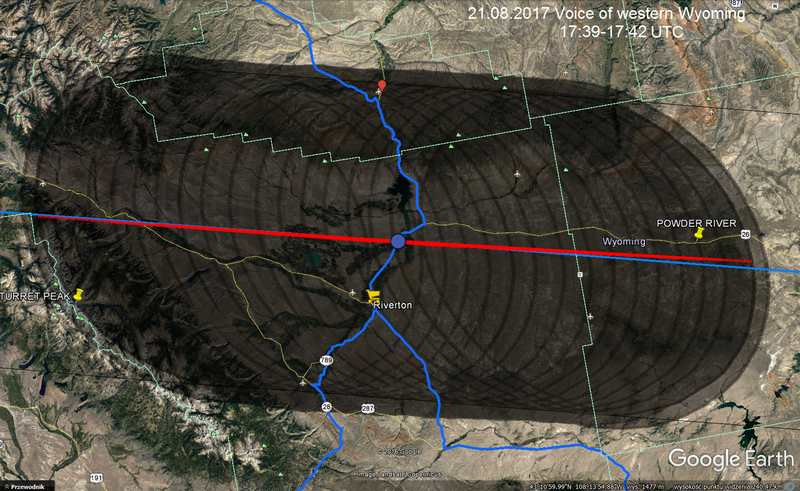 24 The total solar eclipse pattern with both “sky” umbra and “ground umbra” for Casper, Wyoming on 21.08.2017. 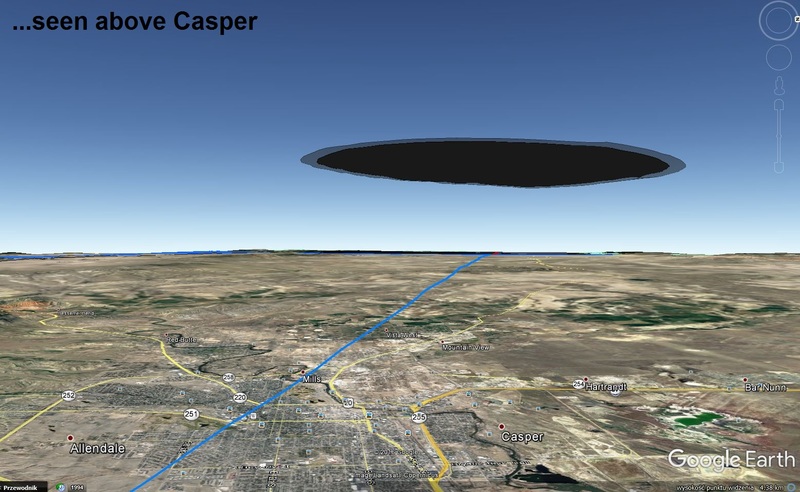 Taking into account the Sun’s height above the horizon in Casper during the totality (53 deg) we can guess, that Sun’s height will be around 52,5 deg (1a) on the southeasternmost edge of the umbra and around 53,5 deg (1b) on the northwesternmost edge of the umbra. This 1 degree difference lies in the diameter of umbra – around 110 km (on Earth every degree of longitude falls around 111 km). 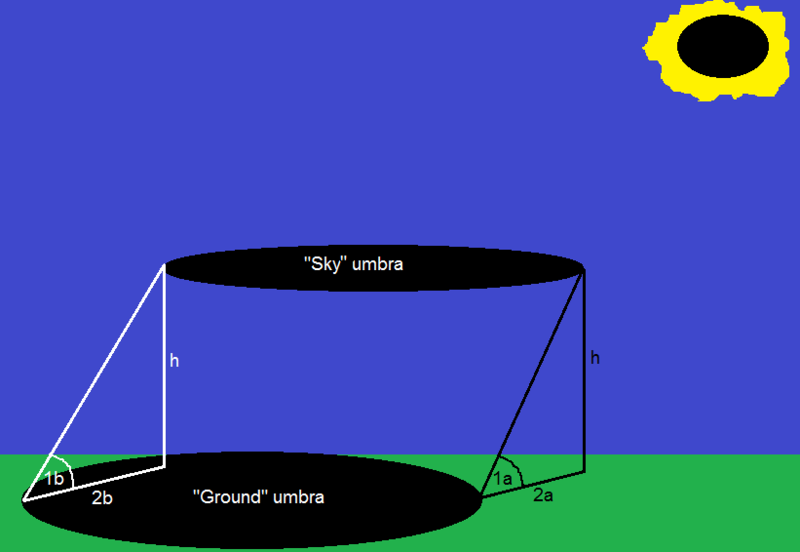 Knowing the Sun’s height above the horizon in those both cases we can calculate the distance from the “ground” umbra edge, where “sky” umbra edge will be seen at zenith. 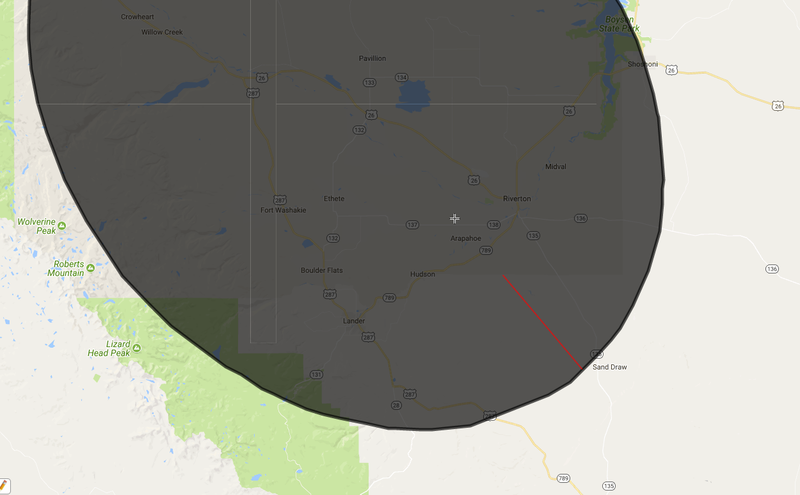 In both cases this area will be south east of the edge of totality, due to the sun position. 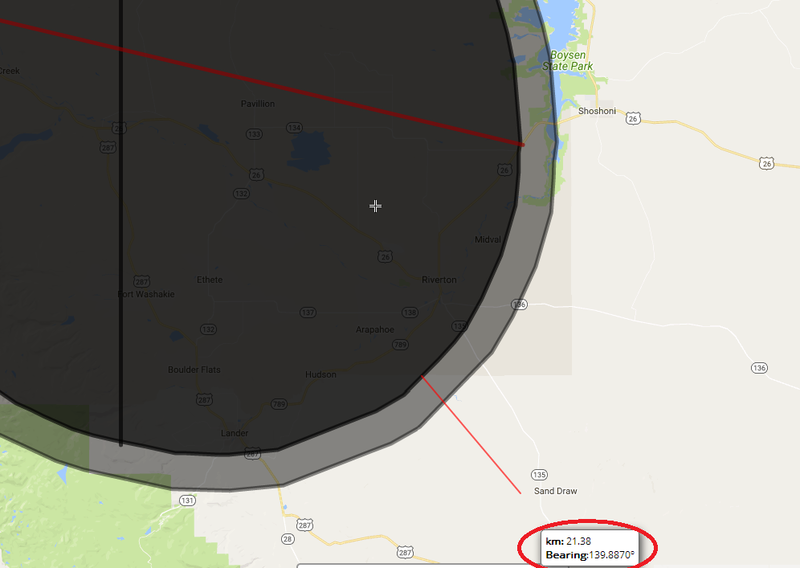 For south east area, the “sky” umbra will be seen in zenith around 20,5 km outside the edge of totality (2a) unlike to opposite place, where Moon’s shadow in the sky will be seen in zenith around 21,4 km inside the edge of “ground” umbra (2b). There are mathematical wonders only. Unfortunately I am a person, who have not ever seen the totality. I am basing my knowledge on the youtube footages only for this time being. 3. Your calculated value given in km allow you to carry on the process in the Scribble Maps. First lead the line bearing on the Sun’s azimuth on the calcullated distance around 21,4 km (pic. 25). Pic. 25 This red line indicates you the rough direction to drag your “umbra” polygon. 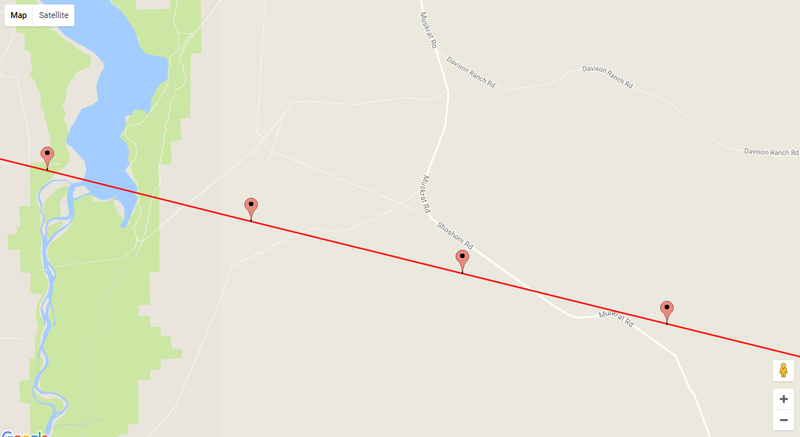 The distance in km and bearing direction has been marked with red. 4. Drag your “ground” umbra towards the Sun azimuth at the moment of total solar eclipse for the value in km, that you counted before (pic. 26). You don’t need the mid-eclipse and the centerline. Remove it, making your shape simple. Pic. 26 The result of your step. The “umbra” shape has been moved along the red line. Remember to do the same thing on the opposite part of the umbra, where value is to be slightly different! 5. 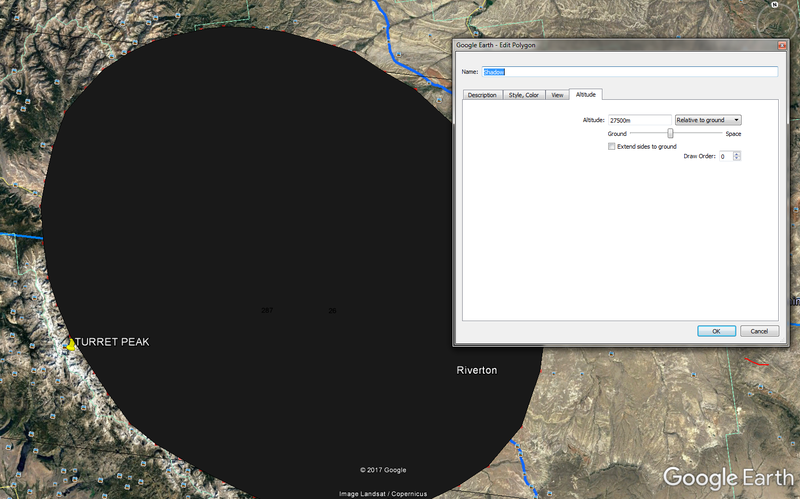 Once you do it change the colour of your new “umbra” to avoid a mess in the further step in Google Earth (pic. 27). Pic. 27 Change the colour of your polygon using options in your toolbar marked with red. 6. 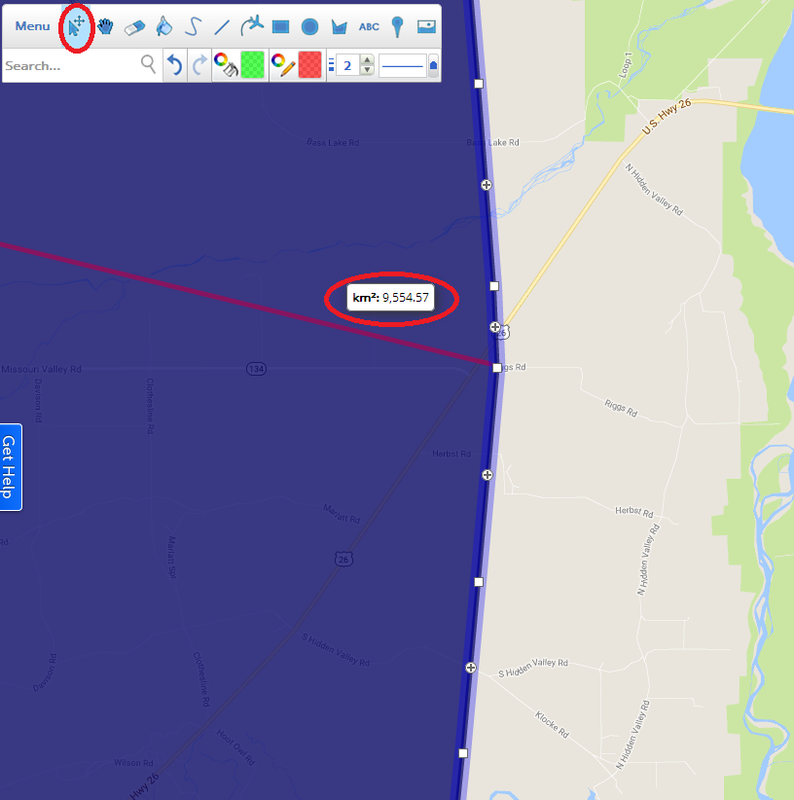 Save your newly located shape as a .kml file and open your Google Earth software. Pic. 28 A “Sky” umbra shape against a shadow traced on the ground. 7. Do the same thing with your shape as per described above (way 1 point 2). 8. Now you can enjoy the full visualized phenomena. 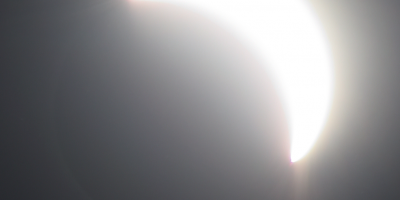 If you decide to make the animation remember to repeat your measurements for at least umbra-long distance to adjust a correct position of the Sun. Pic. 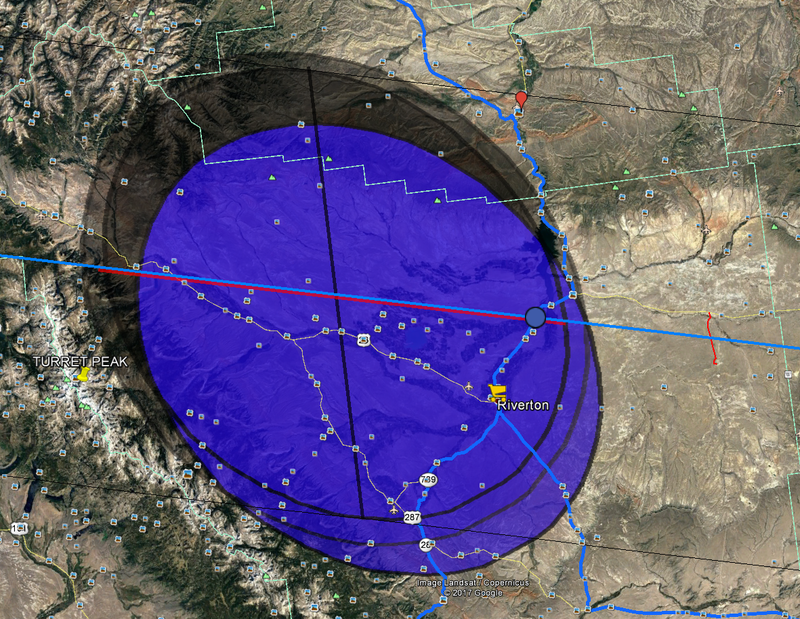 29 View on the ready prepared “Sky” umbra above western Wyoming. Pic. 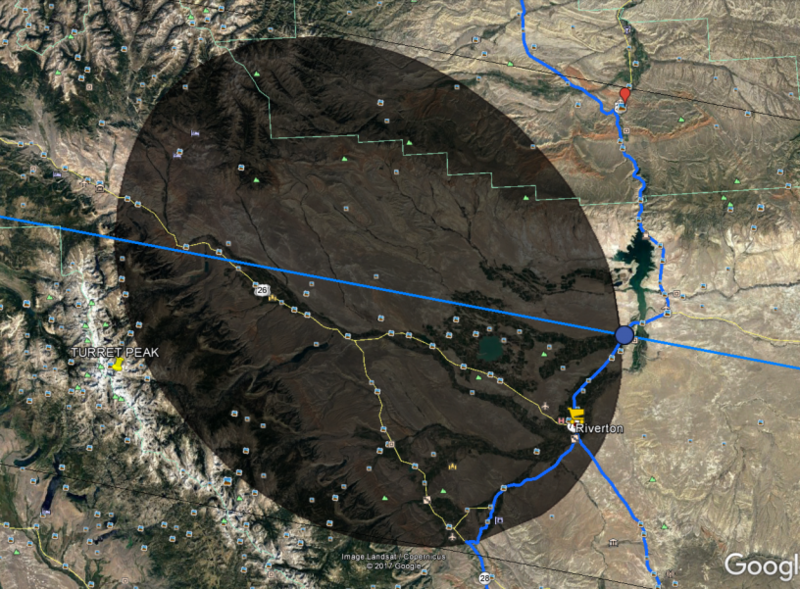 30 Total solar eclipse vizualisation seen from the Boyson Peak in the Owl Creek Mountains range. View towards west at the moment of 2nd contact. This pattern is simplified, without grazing zones. I presented the painstaking method of visualization of total solar eclipse. 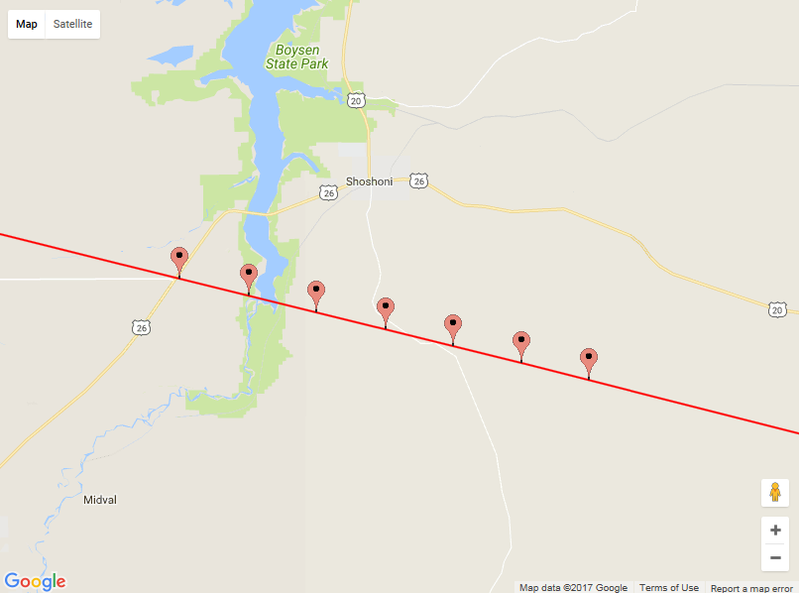 I am deeply hope that my work will influence for the spectrum of the solar eclipse computer software and someone will use my idea to prepare some eclipse program based on Google Earth, that will enable everyone to make this kind of visualization automatically.